On November 7–8, Colgate became the first private institution to host the annual State of New York Sustainability Conference. 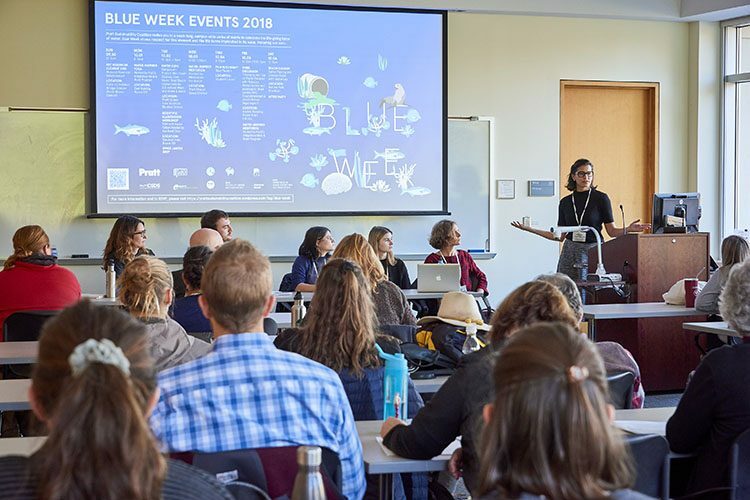 More than 300 sustainability officers, professors, industry experts, and students from across New York State came to campus to discuss climate action, renewable energy, waste reduction, and fostering sustainable behavior. The conference was organized by the New York Coalition for Sustainability in Higher Education (NYCSHE) in conjunction with Colgate’s Office of Sustainability. It featured two keynote speakers: SUNY Chancellor Kristina M. Johnson and Robin Kimmerer, professor and director of the Center for Native Peoples and the Environment at SUNY ESF. The overall theme of the conference was the integration of the United Nations 17 Sustainable Development Goals into New York State campuses. Various sessions, such as “Energy Master Planning to Meet Campus Energy and Sustainability Goals” and “Sustainable Land Stewardship on Campus and Beyond,” discussed both climate change and specific action plans to deal with climatological issues.